Have you ever been there? As a geologist, I am a bit embarrassed to say that it took me until I was 32 to go on pilgrimage to this holy site. I was between jobs, and on my way to Hawai’i to do a bit of consulting work. Never one to just go straight from point A to point B when there might be something worth seeing along the way, I went to work thrashing the airline and travel websites. Tickets from Las Vegas to Honolulu on the Thursday after Labor Day… and a permit to go backpacking off the North Rim of the Grand Canyon. 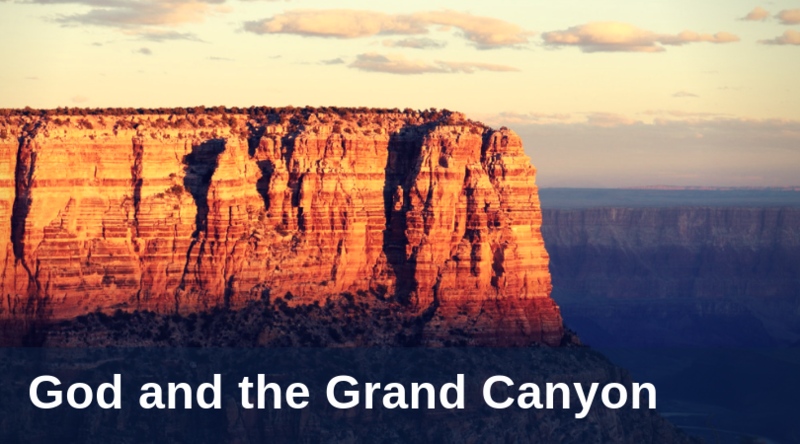 The Grand Canyon is its own course of study into geologic history, a scroll of wisdom laying unrolled for us to examine. Each formation records its own slice of the deep, deep history of this place. Indeed, it is. I understand the potential bewilderment. We’re used to compartmentalizing science and religion. Perhaps there’s a temptation to wonder if this religion stuff is just a fairy tale or if the reality of your future is, at best, to get lithified like one of these brachiopods here, dead as a doornail. If that’s you, I sympathize. I lived that way for a long time. I still feel the gap sometimes. We believe that God emptied Himself and took a human body and tongue. When He did so, He told stories, stories clearly not meant to be taken as narratives of actual events, but stories told to make a point, in which every word bears critically important meaning. We believe He did just the same thing in cooperation with the human writers of Scripture. If I can read the seven days of Genesis like a parable, I can turn to the Grand Canyon with a different sense of awe at God’s revelation. I can look at brown, crumbling sandstone resting upon vertical gray schist, and realize the immensity of time between the present and the day when that first layer of beach sand came to rest on that battered rock surface, and even further back to the prior day when a pile of mud began to get caught in a growing mountain, to be heated and compressed into the gray crystalline schist. Then, if I hold in mind that God created all of this, gave it rules and allowed it to unfold, intending all along to empty Himself and take part as one small mortal being amid the vast expanse of time and space, I come to realize much more about what God’s self-emptying must have entailed. I see more clearly how dramatic it is that this God loves me, in fact even claims me as His son. Instead of mistaking God for a divine watchmaker or a bearded cosmic puppeteer, I get a little closer to the actual God and Father we believe in, the Lord, Being Itself, I Am Who Am. Someday I want to stand out again in the dry Arizona breeze, looking at the beautiful rocks and realizing I am loved, despite how very small I am.